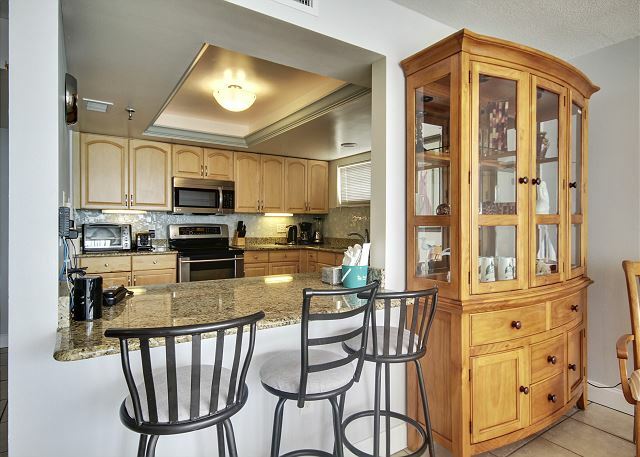 This large, south corner condo has been beautifully renovated and tastefully furnished. 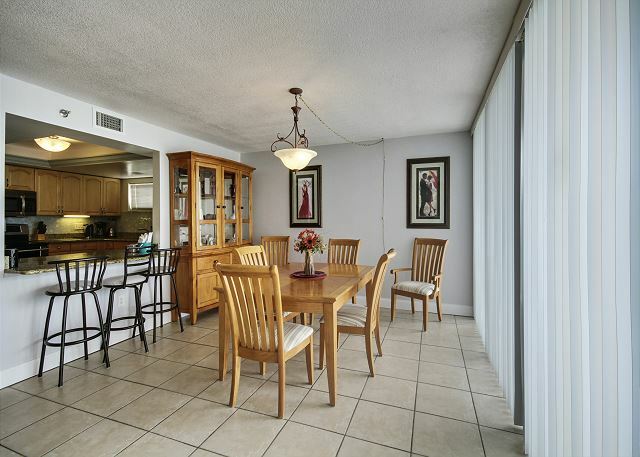 The living room, dining area and kitchen have a bright, open floor plan with beautiful tile floors. Relax in the evening with your sleep number beds! 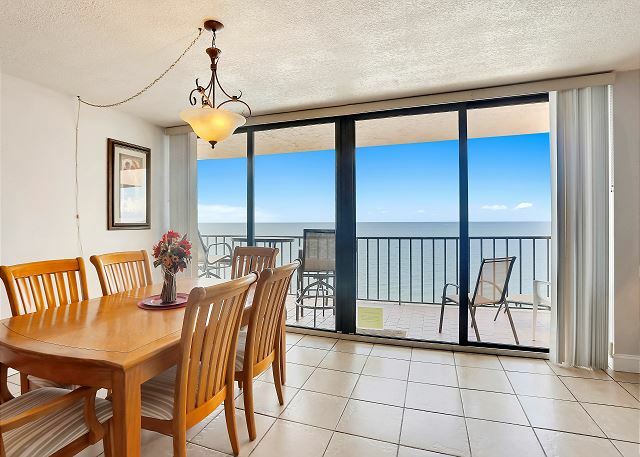 The view of the beach and the Gulf of Mexico from the living room, dining area, the kitchen counter and the balcony is fantastic. 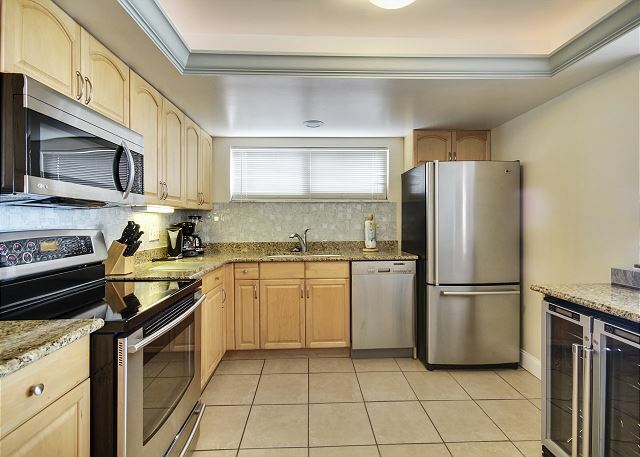 The updated kitchen with stainless steel appliances is fully equipped. Free wireless internet service is available. We love the Trillium as a place to stay for spring break. Always clean and well maintained. Close to everything we like to do in the area! Awesome to hear!! :-) We are so glad you enjoy your time in this premier condo at the Trillium and we will see you for your next visit!! Awesome, we love it!! :-) Thank you for being our guest and we look forward to many more visits. Totally wonderful. The view is spectacular. The beach was beautiful and not at all crowded. The condo was very well equipped (even had sand toys for my granddaughter). Loved walking proximity to John's Landing (fun environment - eating, shopping, etc.) Very relaxing fun vacation and the condo was a great place to call home during our vacation. Very comfortable bed in Master bedroom. Views of beach, sunrises and sunsets are spectacular. Red Tide not a problem and beach’s are very clean. Help support the local business. Lots to do and eat in walking distance. Awesome to hear, thank you Claire! We are so glad you enjoyed this premier condo in our program and those awesome views from the balcony!!! Thank you for being our guest and we look forward to seeing you back for another visit. Lovely condo unit. The only suggestion is to have more cooking utensils ie pots and pans. 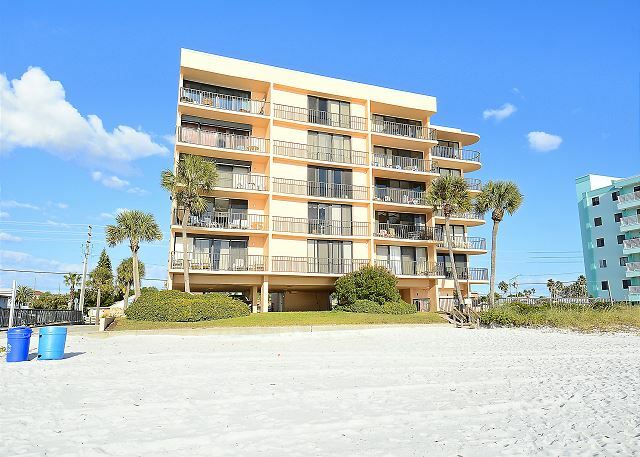 So glad you enjoyed this premier condo on Madeira Beach!! We are sorry if you were missing anything for cooking. Please do not hesitate to call our office if you need anything, we keep a number of supplies at our office and we are happy to help if we can!! :-) Thank you for being our guest and we hope to see you back for another beach getaway in the future. We have stayed at the Trillium several times, we are never disappointed. 5A has awesome patio furniture that sits high so you can really see the gulf without looking through balcony rails. Condo had everything you could possibly need for your vacation. Beds were very comfortable, nothing more you could want. I would book this again. Very nice balcony,great beach,and easy access! 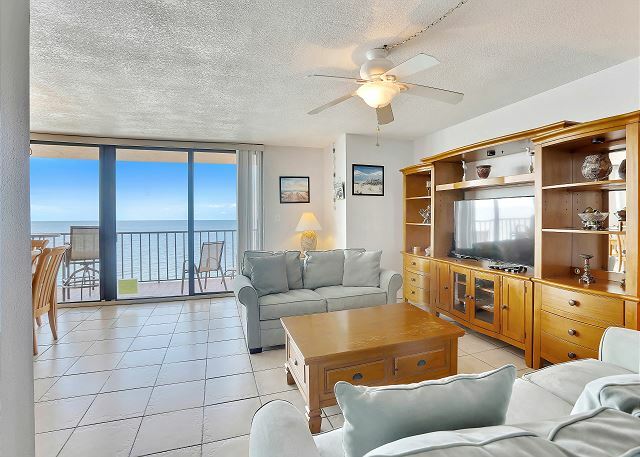 We love this the Trillium Beach Front Condo facility! The people in the office, condo, pool and beach access are the best! we will be back each spring break! Everything was perfect! Thank you! Absolutely wonderful to hear, thank you so much!!! 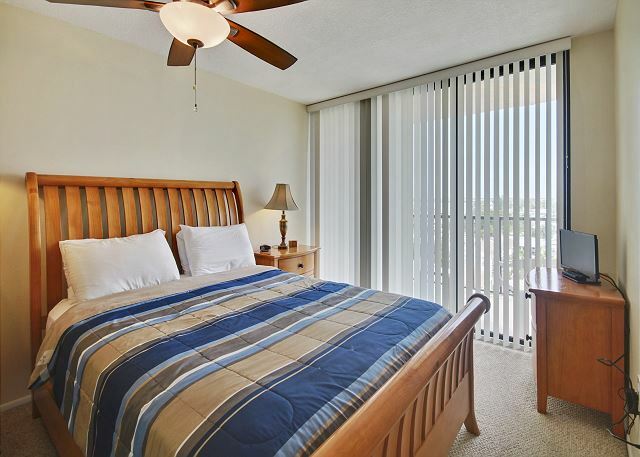 :-) We are so glad you had a good stay in this premier condo and we will see you back on Madeira Beach next season!!! This is wonderful!!! Sounds like a little home away from home. :-) Thank you so much for being a repeat guest with us and we look forward to many more visits!! We've rented at Trillium for the past 4 years and look forward to going back again. 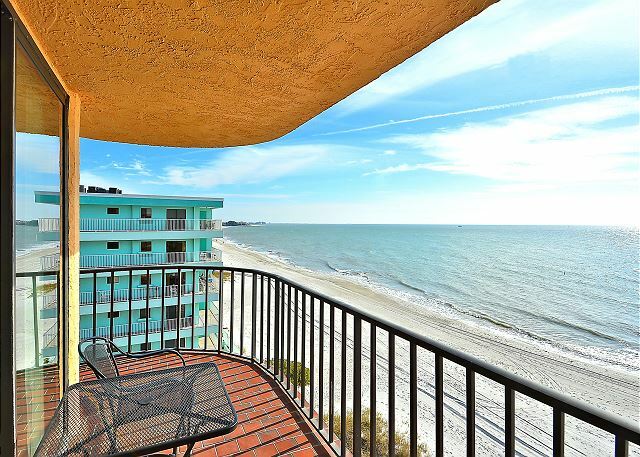 The unit is the perfect size with a fantastic view of the Gulf. The beach is clean, not crowded and well maintained. This is the perfect vacation location. Resort Rentals has gone out of its way to make sure our vacation is memorable. Awesome!! :-) It is a GREAT unit to make your favorite!!! Thank you so much for staying with us and we hope to see you back in your favorite condo again soon! Great condo at a great price! Big balcony right on the beach. Close to Johns Pass. We will definitely be back! Awesome, so glad you enjoyed this premier condo at The Trillium!! Thank you for staying with us and we look forward to your return visit! Overall, a nice experience. We have visited different units at the Trillium for several years. View is incredible, condo is nice. A few small housekeeping notes... Tile floors were dirty and sticky. Thought is was unusual not to have any soap in the kitchen to wash the dishes unless we used the dishwashing liquid. Thank you for this feedback, we greatly appreciate it! :-) We are glad you enjoyed this premier condo in our program but do apologize if the housekeeping was not up to par!! Please do not hesitate to contact us at our office with anything that may need to be addressed, we would be more than happy to have someone come back out and get things corrected for you. 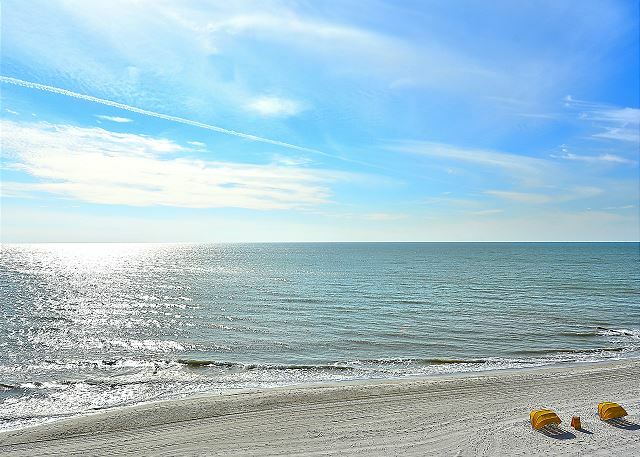 Thank you for choosing to stay with us and we hope to have you back on Madeira Beach for another beach vacation soon! This was the second time that my husband and myself have stayed in this unit and I couldn't be happier with it. The property itself is very well kept and has always felt very secure. The unit is amazing!!! It is spacious and comfortable and absolutely spotless. Everything from the linens to the kitchen ware is wonderful. We really liked the new sofas, they give the room such a light, beachy feel and they are very comfortable. We only had one speed bump and that was when I took the car key to the beach and not the condo key. Resort Rentals had someone there in a little less than 30 minutes and it was worth the un-lock fee. The gentleman who came to un-lock the door for us was very nice. We love the location, there are none of the huge condo buildings nearby and it feels like you have the beach to yourself. There are still a lot of places to eat and shop nearby however we ventured further up and down the coast this time as we were much more familiar with where we were. I can tell you that we will be back again, I love that condo unit! The vacation was everything that we wanted, such peace and quiet, we totally relaxed. I would recommend not only this unit but Resort Rentals itself to anyone. Top job guys and girls! Thank you so much for this awesome post!!! :-) We just love to hear about the great times that our guests have and we are so glad you like this premier condo in our program, it really is lovely!!! Thanks so much for the kind words regarding our staff, we are always more than happy to help how we can! Thank you for choosing to stay with us and we look forward to your next visit to the Trillium and Madeira Beach!! The weather was perfect all week; neighbors were fantastic, condo very clean with high end finishes, and we saw sea turtles at night! Great memories and hope to return! Great memories and a relaxing vacation make for the best combo!!! :-) So glad to hear everything was great for your stay and we love that you got to experience the sea turtles; they are absolutely amazing to see!! Thank you for staying with us and we too hope that you will return for another awesome beach vacation! We had a great time. It was a great location. 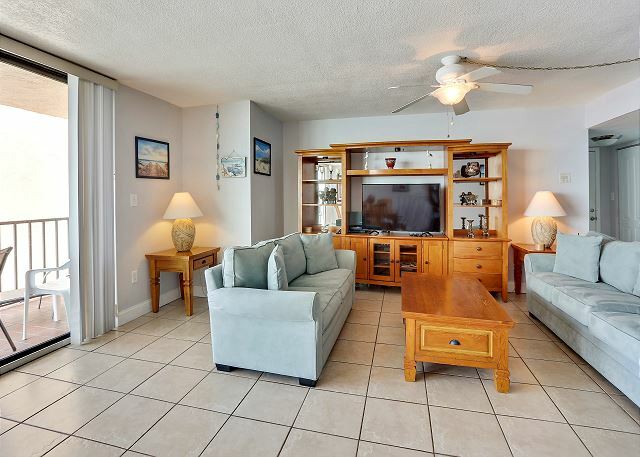 So glad you enjoyed this premier condo on Madeira Beach!!! :-) Thank you for staying with us and we hope to see you back on our beautiful beaches for another vacation soon! second time we have stayed at trillium 5A,we love it! We love that you love it!!! :-) This is a fantastic condo with views that can't be beat!! Thank you for being a repeat guest with us and we look forward to visit number 3!!! So great to hear and thank you for this post! We do apologize for the maintenance items that you have listed here and we did send our staff out to address things, thank you for letting us know. Please do not hesitate to call us at our office to let us know about these items and we will have them addressed for you. We want you to be totally comfortable during your stay! We are glad you enjoyed this location, it really is an ideal spot on an AWESOME stretch of beach!! :-) Thank you for choosing to stay with us and we look forward to your return visit to Madeira Beach! Great condo on the beach. Perfect weather, perfect views, perfect sunsets ! Perfect!!! 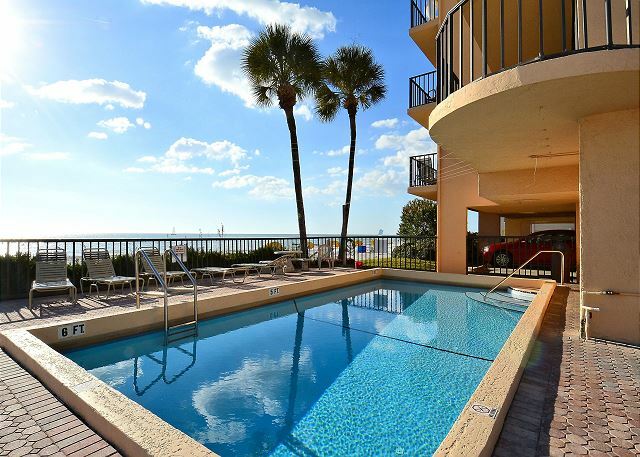 :-) So glad you enjoyed this premier condo at The Trillium and we hope to host another FL vacation for you soon! We have been coming to the area for 20 years. This is our favorite place to stay so far. Everything is convenient and well kept. Thanks for the post!! :-) The location of the Trillium really is great and on an AWESOME stretch of beach, so glad you love it! We look forward to visit #5!!! We've been vacationing in the St. Petersburg area for the past 13 years and feel we've finally found the perfect place. We've worked with other management firms in the past but Resort Rentals has been the best in finding what we wanted and in the best location. The staff is very accommodating and super helpful and friendly. We've truly enjoyed working with them for the past three years. We're looking forward to next year at Trillium! Thank you for your post! We are just so pleased that your found your go to spot and that we are able to assist you with that! :-) Thank you for choosing to stay with us and we look forward to many return visits!! a guest from Souderton, PA does not recommend this vacation rental. 1 - On-going TV problems: reception on-off; sound on-off; remote not working. Resort Rentals Service person stated that the TV is OLD and he had problems with TV before and tried to get owners to purchase a new TV; he would try again to get a replacement TV. Nothing happened! 2 - Metal chairs on balcony are rusted and ruined several shirts from sitting on them. Thank you for your feedback. We are so sorry for the issues that you ran into while you were staying at this condo and we passed this over to the owner for their review. Unfortunately the TV was not able to be fixed during your stay and we sincerely apologize for that frustration! The owner has since put in a brand new TV so all has been corrected with that. In regards to the balcony furniture, we are so sorry for the rust that got onto your shirts! We have passed this information on as well and will have someone go out to take a look at the condition of the chairs. We apologize again for the items that you had mentioned but have and will get everything updated. Thank you for staying with us and we hope to host you again. The Condo location was excellent. Just 1 mile from John's Pass and minutes from great seafood restaurants. The condo was spacious and comfortable. Beach front view was fantastic. Thanks so much for the post! 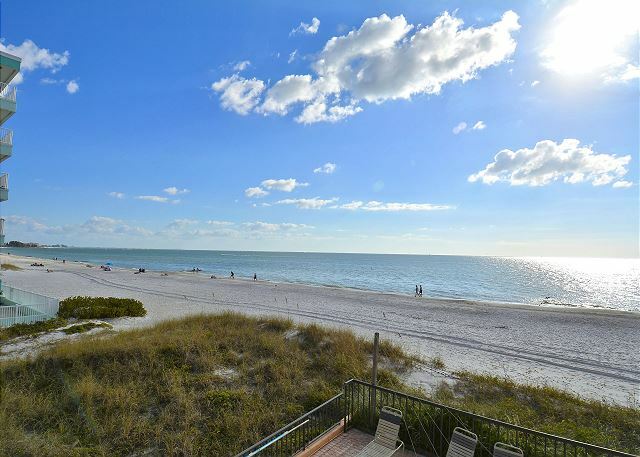 We are so glad you enjoy this Madeira Beach location, it really is a great spot and central to all! :-) Thank you for choosing to stay with us and we look forward to seeing you on Madeira Beach again soon! Our unit was beautiful & very clean. The view from the balcony was amazing. We really enjoyed our stay but was a little scared when the hurricane came thru. The water came in thru the sliding doors and the wind howled thru the windows in the master bedroom all night long & we lost power. Other than the unfortunate situation - it was very nice! We had a very nice and relaxing time. Have plans to return. This is our 5th time renting Trillium 5A. Check in at Resort Rental is a breeze. Staff is friendly and fast. The condo was clean and the kitchen is fully stocked. The location is perfect. You are close to great eating establishments and the beach and ocean is right out your door. The view is perfect. We will definitely rent this condo again! I had a wonderful stay at this condo,it was very clean and a great location. We had beautiful weather. Check in was very easy and professional. This girl's week vacation was a much needed get-a-away from Dallas, Texas. The pictures of this place do not do it justice. We did not want to leave the balcony, as the view was breathtaking. The place was squeaky clean, and offered all the amenities necessary for a comfortable stay. We hope to return to this fabulous place again!! We love the location and accommodations. Literally a few steps to the beach. The condo was all set and ready with everything we needed. The pool was the perfect temperature forswimming We have been spending spring break in this area for 19 years and this is our FAVORITE place to stay. This was our third year staying at the Trillium, and once again had a great time. The condition on the sofas in the unit, issues with the TV and the quality of patio furniture is the reason for 3 star for "property's general condition". The location/view is awesome and we have met some wonderful people! We've been vacationing on the St. Petersburg area for the last 10 years and this was the best place yet. 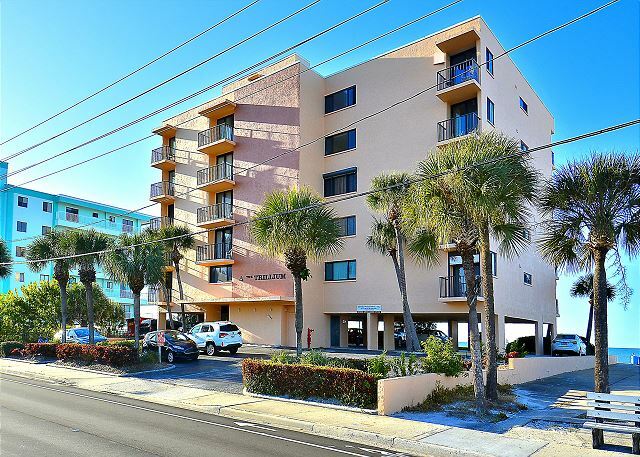 Right on the beach, close to shopping and great eating establishments - what more could you ask for? The unit (one of only 15 in the building) was spacious and well laid out. The kitchen and bathrooms had been recently updated. We were so pleased that we've rebooked for next year! Get away to the Gulf! We rented this beautiful condo in a small building and it was so lovely. The sunsets, viewed from balcony or dining table were breathtaking. The St. Petersburg/Tampa area is full of wonderful things to see and we made daily trips to enjoy them, as well as the plethora of good restaurants! The unit was far better than our past rentals in other cities. It was spotless and had been updated in almost every way.. We could walk right out onto the beach and had a great view. Overall a great experience. 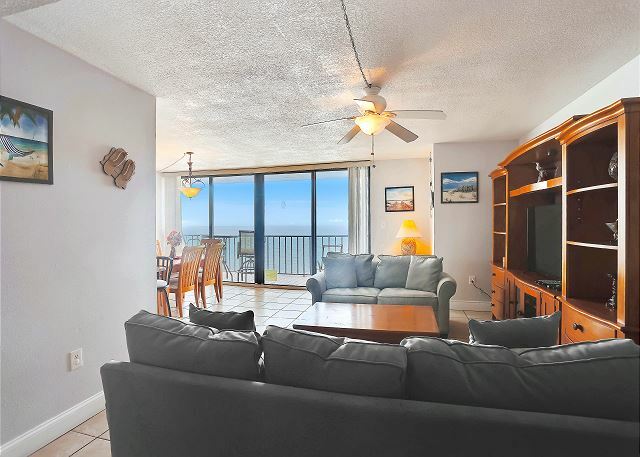 Great Condo right on the beach. Check in is easy. Pick up your keys and condo is not far from from rental office. Nice balcony to enjoy the watching the dolphins play in the water. Rommy bedroom. Bathrooms have been renovated since our last visit and they are nice. The kitchen is very sufficient and even has a wine cooler. I would definitely rent this condo again and recommend it to others. The whole experience in our condo was so amazing that I cried when we left! We had such a frustrating time getting our rental car and were running a little late,I hate to drive places that I do not know in the dark. The directions were so helpful and accurate. Even though we missed our first sunset when we walked into the condo I think my jaw hit the floor. It was perfect!!! Stepping out onto the balcony all of our frustration just slipped away. The unit was spotless, the linnens were top quality and plentiful, the appliances were upgrade and spotless...I cannot say enough about how wonderful the week was. The location was amazing and we were pleased at the short walk to the water. We loved the size and layout of the unit and the furniture was very comfortable. We saw dolphins every day from the balcony and I think that the way our unit was set back a little made it the best in the building as the unit in front of blocked the sun until the air cooled down at 6pm. All in all if we come back we plan on staying in the same was absolutely perfect! We have told everyone how much we loved it and how much fun that we had. If you could, perhaps a couple of boxes of kleenex would be appreciated but that is such a small thing. I really miss the condo!!! Condo was very nice really enjoyed the location. There was an issue with the breaker box throwing often though and the kitchen could use some new skillets. There was none to cook with. Thank you for your review. Sorry about the issues you experienced. Next time if anything is not up to par or you are missing any required items like cookware, just let us know. We have no problem revisiting a property to make things right. Thanks again and we hope to see you soon. Great location with everything needed inside the unit. Excellent views and easy beach access with little to no crowd. Only negative was the sleeping temperature in the bedrooms was hot, it was like the back bedrooms were 10 degrees hotter than kitchen and living room making evenings hard to sleep. We had a wonderfuld trip. The condo was the the perfect location!! We loved being right on the beach. We enjoyed the balcony overlooking the gulf, in the morning and evening we could watch the dolphins play! 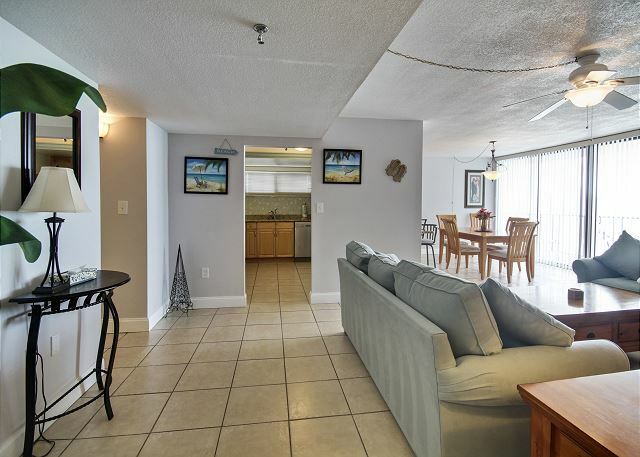 Condo was clean, great location, fantastic beach, good fishing. Like any home I've ever rented, it has its quirks, but nothing major. I mean, I am there for the beach and time with my family! 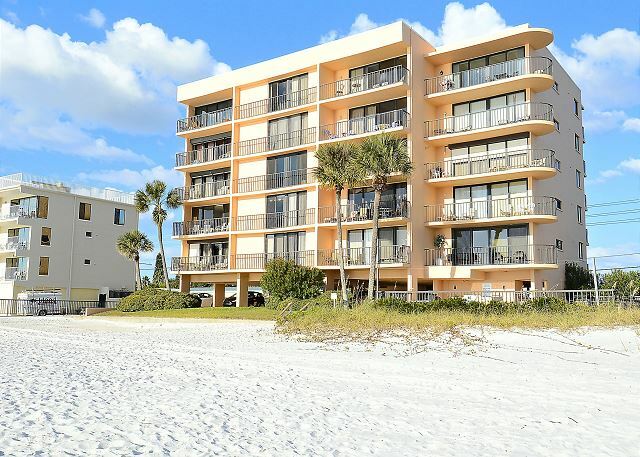 Unlike beachfront condos that require a 10 minute walk through the building and another 100 yards to the beach, it will take anyone about 60 seconds to go from condo to the beach. We used the price diff between this and Destin to pay for Busch Gardens for 5 people. We met several vacationers who return every year and we will do the same. We love the location of the condo. Several issues-elevator and lobby area not well vnetilated and quite warm. Management company was responsive to request for new TV controller. Unfortunately, the AC was below par in the unit, despinte the fact we followed the guidelines for temperature control, it did not seem to keep up at all with the comfort level we expect with AC. We have been coming to this area for years and the Trillium is our favorite place to stay. The condo was clean, the pool was amazing with restrooms poolside and the beach was nice and close. We reserved it for next year, when we dropped off the keys. Thank you! This was our second stay at the Trillium and again it was a great vacation. 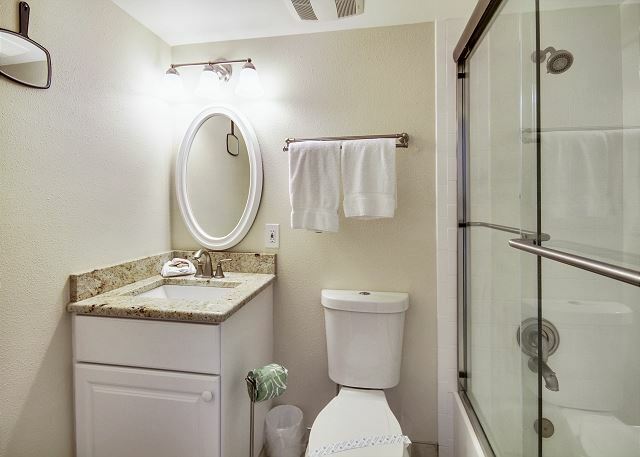 The condo is clean, bathrooms have been updated and we find the quiet environment very appealing. We met some great people and are excited about returning next year. Had a great time. Condo is beautiful. It is the best we have rented. Near everything we wanted to see. no comment-I wish that someone had told me that there was a cart available to cart your groceries from the car to the condo unit!!! !That made me mad! Love this beach area great for families never too crowded. This was a great holiday selection: easy acess, spacious unit, amazing balcony, comfortable beds, beautiful uncrowded beach, nearby restaurants, direct beach access, nice unit. Needs to replace lock on ground floor acess door as difficult to open. Suggest uou hire the beach umbrella and lounges from the guy on the beach- he'd very flexible and you can prevent sunburn. Thanks for such a great review. Sorry to hear the exterior lock was an issue. I was told by the Trillium's Condo Management Association that tends to the exterior of the building that the lock was replaced and works well now. Thanks again for your review and we hope to see you again next year. The condo was so nice,clean and well equipped! the views were absolutely amazing,the beach was perfect! if there is any slight negative it would be that there were no cleaning supplies at all,so we purchased detergent etc and left it, "pay it forward!" Resort Rentals were very nice to deal with,answered all emails and phone calls promptly. 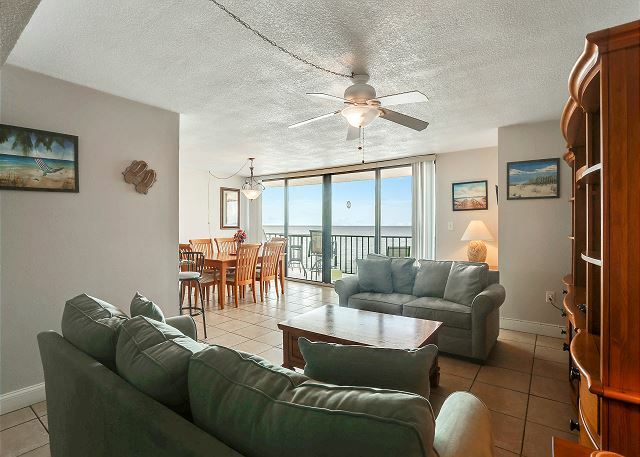 We would certainly recommend this condo to friends and family,in fact we are already talking about our next vacation there! This is our 4th time staying at the Trillium 5A and every year we don't want to leave and can't wait to return. Check in is fast and easy,everything is ready for you. They are friendly and basically you pick up your keys and go! 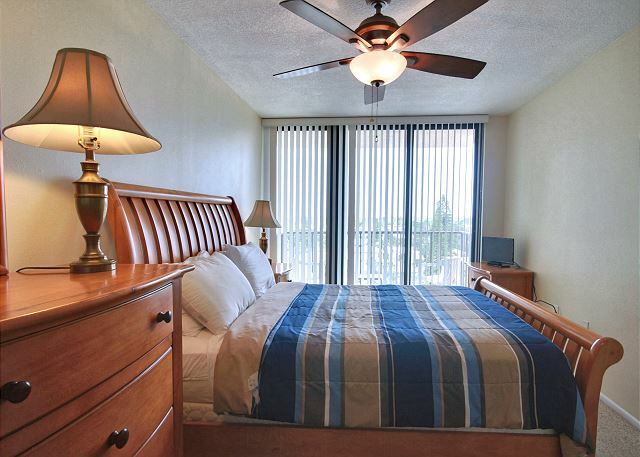 The condo is a short 5 minute drive and you are ready to enjoy your week. The condo is always clean and stocked with start up supplies. The kitchen is fully stocked with enough cooking utensils. TV's in both bedrooms and living room make for a nice addition. The balcony view is perfect to watch the waves roll in. Then down to the beach which is right outside the covered parking area. The beach is clean and there are cabanas and chairs to rent but our condo had chairs and umbrella and sand toys in the hall closet. The swimming pool is clean and was never crowded when we were there. All in all Trillium 5A is the perfect spot for a wonderful vacation and I can't wait to return in 2015. Madeira Beach is a lovely, clean, secure area and while we were there the sun shone every single day; we saw 10 minutes of rain the entire 15 days. Trillium #5A is a fairly nice condo with some recent upgrades to the kitchen. We really appreciated the very comfortable king bed which is similar to the one we have at our home. The front load HE washer and dryer were a plus because it is similar to what we have at hour home (I really dislike the old style washer and dryer!). However, the bathrooms are 1970 and are in great need of upgrading. There was one stainless steel pot and steamer for cooking while the others were all very old non-stick pots and pans with much of the non-stick deteriorated. The owners asked for feedback and we did mention the pots and pans. They responded to say they would take a look at it the next time they are there. The pool is very small and for most of our stay had three of the five pools chairs broken. A few days before we departed, an owner of another unit checked in, realized the problem and promptly had the broken chairs replaced as well as had the lock fixed on one of the outside door entrances. I admit that my husband and I didn't advise Resort Rentals of the chair or lock problems because other folks that we chatted with indicated that it wouldn't do any good to ask as they had asked and received no response. Thank you for your review. I was very pleased to see that you enjoyed your vacation and that the weather was cooperative. I do apologize for the issues you encountered while staying with us. Please do not ever hesitate to give us a call if something is not up to par. 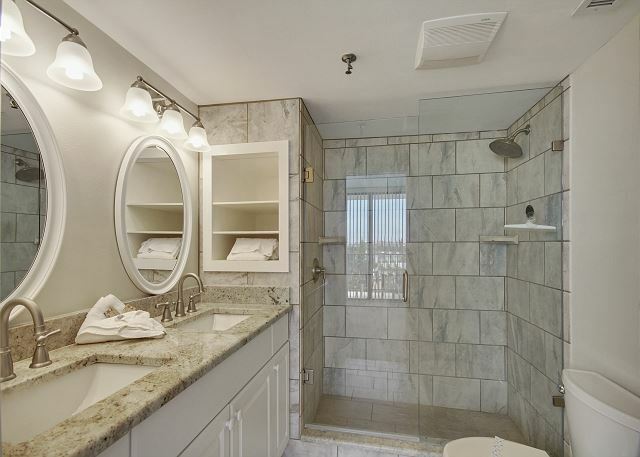 We have several items at our office and have no problem replacing worn or unusable amenities in any of our condos. 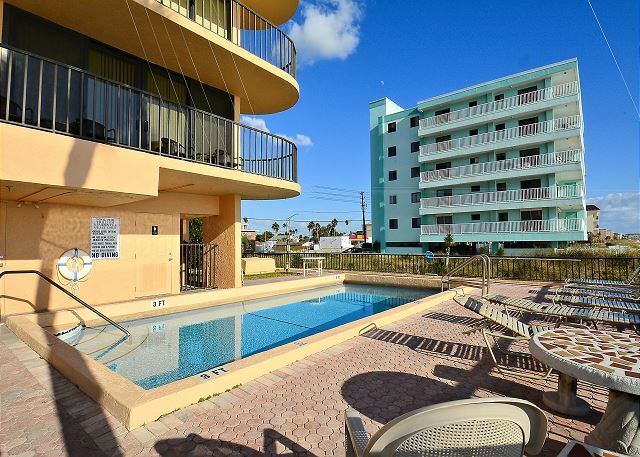 Although repair of the locks or replacement of the pool chairs are beyond out purview we would be happy to contact the condo association about any issues so they can look into them. Thanks again for your review. We truly do appreciate the feedback! This was our second time to 5A and it's a great condo. Love the Beach and area. and the fact that it is not real crowded in this area and yet it is close to many nice restaurants, shopping, etc. Resort Rentals have always been great to work with. Our vacation was fantastic, we have been using this company for 10 years if there were any problems, which was not often they were handled in a timely matter. We have more "good" comments about this property than "bad". Intended as "constructive criticism" only, we found the cutting utensils extremely "dull". Very hard to cut anything. The Y-FI did not work causing some problems with our lap top. Nowhere to sit in the bedrooms (need some chairs). The sleeper sofa is old and worn out. Somewhat uncomfortable. Other than these minor issues we enjoyed our visit and was satisfied with the property overall. We have been coming to the Trillium for several years and this was our first visit in 5A. We'll be back! This was our second stay in the Trillium (different unit) and you can't beat the location. 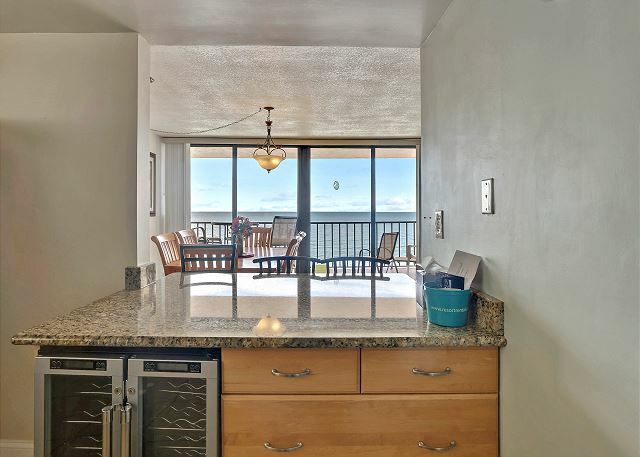 Condo was spacious and well appointed, beautiful view that can't be beat. We do recommend carpets and upholstery to be deep cleaned more often. All tile flooring, wooden dining chairs (no upholstery) and leather couches may be easier to maintain, just a suggestion :) Overall we would definitely come back, loved our stay! Overall the unit and the property were quite enjoyable. The stairwell and the elevator left some room for an update, seemed to be lacking in that area as well as the bathrooms in our unit, 5A. The beach was amazing and the view from our balcony was superb. This is our third stay in this condo and it has all the comforts of home. The kitchen is well stocked, the wine cooler is a plus and the overall condo is so relaxing. Just steps away from the beach and pool. You can enjoy viewing the ocean from the balcony. Hope to return for a 4th trip. Stay here! You will like it. For a rental property it was very comfortable and we felt very much at home. We eat out very little so a well equipped and updated open kitchen was an important consideration when selecting a rental. This kitchen did not disappoint. However we suggest that perhaps you would consider adding a large pot and a colander for cooking pasta. Beautiful view from the dining room as we ate our meals. Also liked the tile flooring so it was easy to keep clean. Would definitely like to stay there again. Thank you for allowing us to share your bit of heaven. We really enjoyed our stay,and have a few suggestions.A leather or cleanable surface for sofas is a better solution for furniture.Mixer was not usable and dishwasher not that great.The floors were not level so initially we were abit uncomfortable,but we got used to for absolutely everything else we were very pleased.Condo was very well cleaned and we really appreciated how nicely it was kept and smelled so clean and fresh( much cleaner than any homes we had rented in the past) . People in the area were also very friendly and nice and we were close to everything. The area had a community feel to it and had a great pizza place close called Brits pizza. Awesome Vacation on the beach. Cannot fault this accomodation and location. We will be back for sure. location of the trillium is wonderful. very nice unit, very clean, and has up to date furnishings. We have no complaints about the condo and the rental agency the condo was great and agency was very nice..The only complaint we have is people taking their children and not watching after them, the group that was below us let their children run uncontrollably around the condo beating on peoples doors, eating in the pool to where others couldn't swim because of the food in the pool, playing with the elevator, running from floor to floor on the stairwell pushing buttons, and eating and breaking dishes in the stairs to were it was nasty and stunk! !So my advise to people who take children please have respect for the others staying there cause they to worked hard to pay for a nice vacation!! And for the people who stayed there with their children that week who did not control their children, all I can say is shame on you!!! This the 2nd time we have rented this condo. The location is perfect. You walk out thru the parking lot and you are on the beach. The condo is roomy, the kitchen is well stocked and even has a wine cooler. The ocean view from the balcony is amazing. 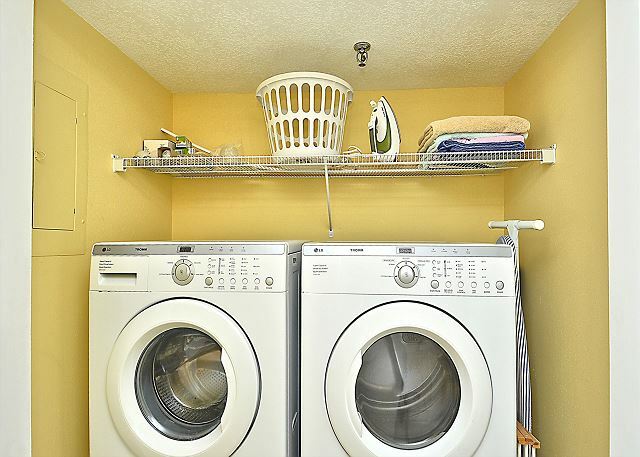 There is a washer and dryer in condo for your use. The condo was clean and relaxing. We will definitely rent this condo again next year! An excellent condo in a great location. Highly recommended!!! difference from four to five star..great time..
Condo exceeded our expectations. 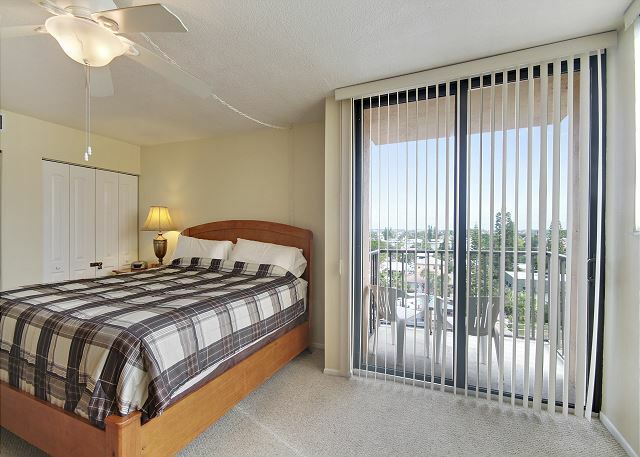 The unit is large with a beautiful, renovated kitchen and fantastic view from the balcony. The beach was quiet as was the condo(not once did we hear anything fom the neighbours beside or below us). We had a great time! Only complaint is that there is no place to re-cycle bottles or cans on the property. Maybe put a few containers in the garbage room or in the parking garage. very nice place to stay! and very quiet location. Only negative things I could say is pool was very small and not heated and keys were hard to use to door in the lobby. Thanks so much for the high ratings! Although we cant do much about the size of the pool, I will pass on your other comments to the Condo Association. Great place at a very beautiful location! We were very comfortable there & had a great time! We love the location and the property. Very well maintained. The condo was fabulous. Parking is somewhat awkward in the garage. But, otherwise, it was great. we were thrilled with the condo.hope to come back next year. we would highly recommend it to everyone. beautiful location as well! Trillium 5A is an excellent condo. Beautifully decorated and right on the beach. Close to everything. I would love to stay there again. We loved our trip to Madeira Beach. The condo was great, we were a group of 6 people including 2 kids. The condo was big enough for the 6 of us. The beach was very quiet, perfect for a family with young children. The pool was great for us and our 3 year old, he was in the water all the time. We used the beach chairs and outdoor toys everyday. Thank you so much for a nice family time in Florida! This was a beautiful vacation spot. The view was spectacular and the beach was great with awesome sunsets at night. What I liked was that there were beach chairs and other items available right in our unit with a washer and dryer. The kitchen was new and updated and 2 large bedrooms as well. The living space was just the right size for 3 of us (you could comfortably fit 6). We were looking for a beach that wasn't overcrowded so this was perfect. Right up the road about a mile is St. John's Pass with great restaurants and shopping. Easy access to para-sailing and jet skiing as well. I would definitely come back again next year. We have stayed in Madeira Beach several times. This was the nicest unit we have rented. 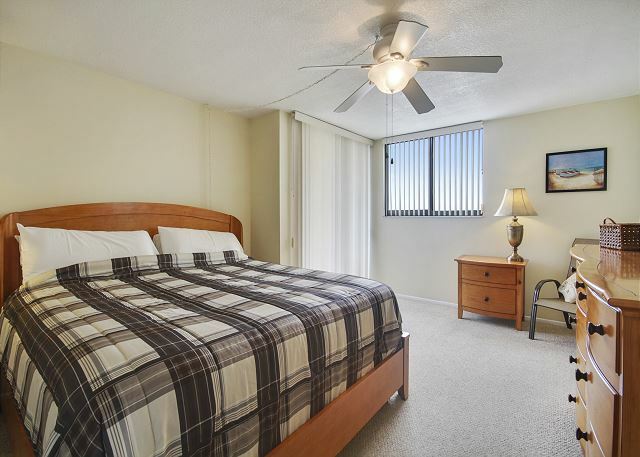 Very clean, nice furniture, up to date appliances, and friendly, helpful resort agency. Our son, daughter-in-law and baby grandson spent a week with us. The Madeira Beach area had many things for them to do. Beach toys in the unit were an especially nice find when playing with the baby. The second guest room was roomy enough to accommate a pack n play comfortably. Restaurants in the area welcome children. All in all a great family experience. First of all, we live in Pickerington! Now for the additional comments. We really do love the location of the Trillium and were reasonably satisfied with this particular condo. We did think that it could have been cleaned more thoroughly before we arrived. We have a habit of removing our shoes in our own home and proceeded to do the same in the condo. We were dismayed to discover that the soles of our feet were quite dirty in no time at all. That cured us of walking around barefooted. We did think that the kitchen was nicely appointed and had most of the supplies that we were interested in using. The appliances were updated and everything worked. Upon arrival, we were surprised to discover that there was not a single hanger in the unit. We made a quick trip to the dollar store so that we could hang some of our clothes for our month stay. I imagine that people who were staying a shorter amount of time would not be bothered by some of the things that I found troublesome. All in all, we were able to put up with some relatively minor glitches because of the great location, wonderful views, gorgeous sunsets, etc. I have no doubt that we would rent here again. Clean, Upgraded & right on the beach. It's the corner unit on the very top of the building. This building may look a bit on the older side, but be fooled. It's super clean and well maintained. We loved it. Our 2 year old LOVED it also. It was nice staying in a building with only 15 units. The pool and beach were never crowded. We had a wonderful time on the beach. Great view and wonderful amenities. Would recommend to anyone wanting fun family time. Our 4 year old granddaughter was in the water non-stop. She had a ball! The condo is beautiful and very up to date. We will definitely be back! The condo was great and a wonderful view of the gulf.